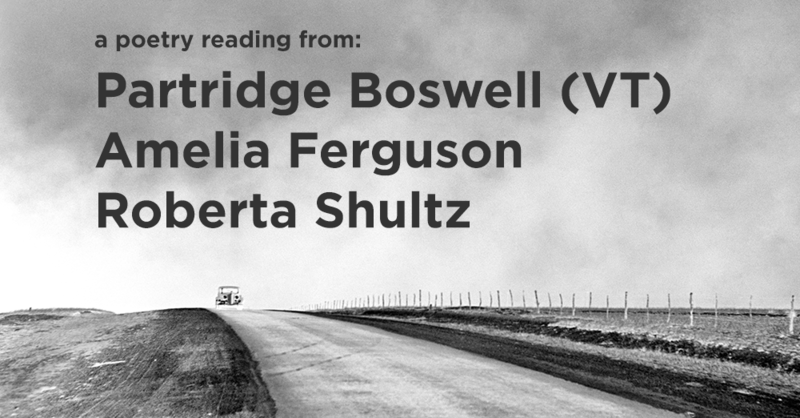 Chase Public is happy to welcome poet Partridge Boswell, visiting from Vermont, for a reading alongside local writers Amelia Ferguson and Roberta Shultz. Partridge Boswell - Recipient of this year’s Edna St. Vincent Millay Poetry Prize for his poem “Flying home after the protest,” Partridge Boswell is the author of Some Far Country, winner of the Grolier Poetry Prize. His poems have recently surfaced in The Gettysburg Review, Salmagundi, The American Poetry Review, Green Mountains Review, Forklift, Ohio and Hayden’s Ferry Review. Co-founder of Bookstock literary festival and the poetry/music group Los Lorcas Trio, he teaches at Burlington Writers Workshop and lives with his family in Vermont. Amelia Ferguson - was born in Portland, OR and has since resided in various parts of Oregon, Utah, Texas, Cincinnati, New York and Kentucky. She currently resides at 1107 Vine Street in an odd apartment with two bathrooms. Amelia considers herself an artist with serious commitment issues who graduated from Art Academy of Cincinnati in 2015 with a BFA in Sculpture and Creative Writing, and will begin pursuing a Creative Writing MFA at Bennington College's Low Residency Seminar. Her work appears sporadically as sculpture, installation, electrocution, performance, word-working, nonsense and merrymaking. She is not left handed, but does have a god-complex. Roberta Shultz - is a singer songwriter, teacher and poet originally from Grant's Lick, KY. Her poems and song lyrics have appeared in Still: the Journal, Motif, Waypoints, Kudzu,The Notebook and other anthologies. Outposts on the Border of Longing is her first chapbook of poetry, published in 2014 by Finishing Line Press.